See the forest for the trees. : change. so i've come to embrace change or at least not run screaming from it. not always without a little tantrum-throwing on my part. but i'm learning to like change. just say the words & i'm there! BUT, i'm also a big talker. so many things look & sound lovely to me on paper. but i'm none of those things. i try, but not gracefully. i second guess. i over-think. and when it comes to making a change, it's either all or nothing. and even THEN, i second guess & wonder what if & ponder forever. but change can be good & i look forward to it sometimes. keeps things exciting. invigorating for someone who's not good at doing either. but a recent change has left me with this melancholy-ness. the move of a sweet, little friend. well, that's what i've been telling myself between tears. they didn't move to china. but they were across the street. both our families moved in about the same time, 5 years ago. new families, each having one baby boy around a year-old. 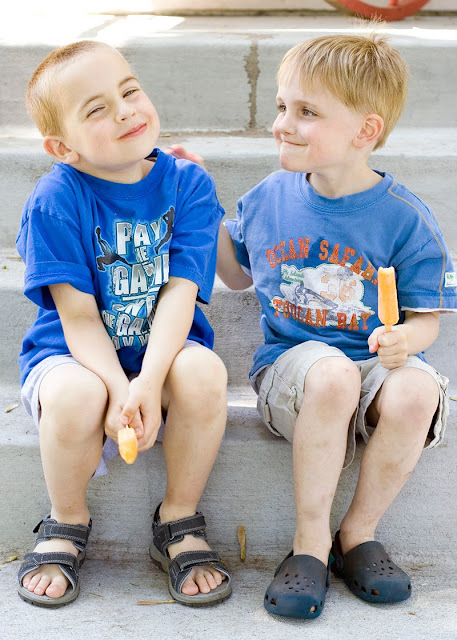 unaware of how our lives would soon be CHANGED with siblings & house projects & mini-vans. but for the moment, just our baby boys. 2 years old & quickly toddlin' their way up to preschool. playing NEXT to each other, but not really WITH each other, for some time. about how things are not what they used to be. kids don't leave the house at 8 am & come home when they hear mom screaming for dinner. the thought of letting our kids get on their bikes & ride to the grocery store 10 blocks away, seems unfathomable. with all the crazy kooks out there? the high school kids driving too fast? well, i guess our kids are too young yet, for us to be envisioning that life anyway. maybe we'll think differently on that when they're older & more responsible & more understanding of what being safe & cautious means. more trusting & willing to let him just go play with his favorite buddy. watch out for their little sisters. 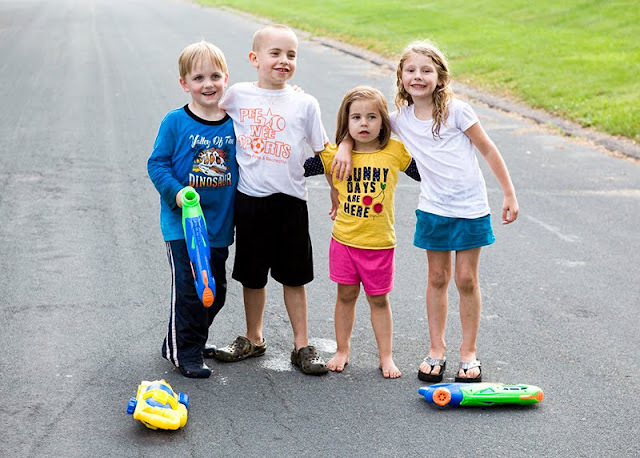 chase each other with squirt guns. never grow tired of each other or of being outside. and they're safe & they're having fun. but nothing last forever, right? sam & his adorable sisters have moved. and i've been anticipating this 'transition' since their house went on the market. mostly because i knew jack would be losing his bud & the convenience of having someone his own age, who he ADORES, right across the street. but also because of what this means. the 'end of an era,' my husband would say. the end of. . .something. our chidren growing up & moving on, which i don't deal with well. but decided to wait another year or so. i know the time too, will come, when we will outgrow our cozy little place as well & be ready to move on. in the meantime, our little world on the north hill will continue to change each season. our children will experience as they grow. funny enough, i don't think they even really know yet, that something has changed. that our life on the north hill will be different now. that they can't just run across the street to sam's anymore. greet each other with screams of excitment when they've awoken from their afternoon 'rest time' & are ready to play again. i'm aware of all of these things that will no longer be. everything IS always harder on the parents, right? it is for me. i take things so much harder than my children. and know i can go to those memories anytime, for a laugh or a smile. and we'll always have our photographs. and are still to be had, even if from across town.